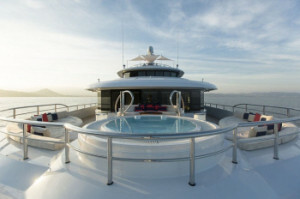 Excellence V Private Yacht Charters in the Mediterranean. 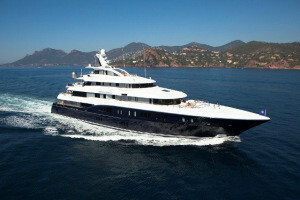 Excellence V Private Yacht Charters for the ultimate Mediterranean Vacations. Enter into the upper deck forward where you will lay your eyes upon a king size bed facing forward with an impressively sized sky light overhead boasting 180-degree panoramic views. Continuing to scan the room, you will come across features like a vanity desk, comfy sofa, plenty of closet space, and a refrigerator for those late night snacks you like. 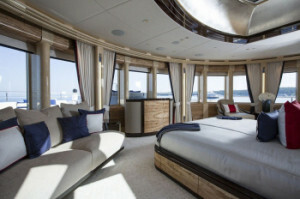 Moving forward into the his and hers bathroom with both a shower and Jacuzzi before entering out onto the private walk around terrace with sun pads on either side will surely make you feel right at home while on board your Excellence V private yacht charters in the Mediterranean. And while you take comfort in the master suite, your guests will also get to be pampered in their own rooms and ensuite bathrooms. While not lying your head to rest after a long day of adventures inside your luxurious guest rooms, you can be sure to make use of the upper deck’s Owner’s Saloon where a full width aft equipped with 2 arm chairs, 3 sofas, a game table seating up to 4, a powder room, and an additional table await you at your leisure. 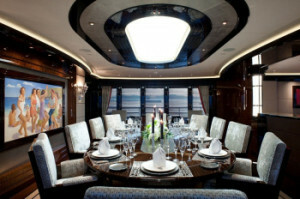 On top of that, you can enjoy watching a movie in the Cinema featuring a projection screen and surround sound before or after enjoying dinner made by the professional on board chef inside the Formal Dining Room in which after you can sip on drinks at the Sports Bar or relax inside the Jacuzzi on the sun deck. For some active fun during the day, make your way to the lower deck where the gymnasium comes fully equipped with the highest class treadmill, elliptical machine, free weights, and yoga equipment. Or maybe you want to go for a dip? Enjoy the beach club that opens out with a drop down island featuring 2 chairs with a table and a wet bar with 3 stools. To get your adrenaline really going, you can always make use of all of the water sport equipment guaranteed to get your blood pumping and put a constant smile on your face. 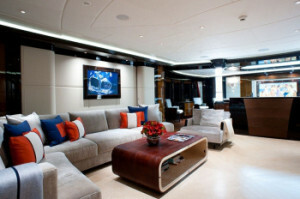 What more could you possibly want when it comes to renting a luxury crewed yacht charter? Whether your destination of choice includes the British Virgin Islands, Caribbean, Mediterranean, Bahamas, Greece, or the French Riviera, we are confident that no matter where in the world you are, Excellence V Private Yacht Charters will ensure a holiday unlike any other. Give us a call on 800-478-2029 and we can discuss all of the details with you and get you on your way to planning the holiday of your dreams in no time at all!